Today’s post is the last in the holiday brunch series, and I thought I’d offer up just a few more tips on making your brunch a success. 1. Finger foods: Never have I ever seen a holiday home brunch where every single person sat down at a nice, long table complete with place settings and a solid surface to cut their food on. Where’s the fun in that? Keep your food small and finger-friendly, and if you must use utensils, limit it to forks. That way everyone can still eat even if they’re standing, and everyone has a free hand for a cocktail. Duh. 2. Keep it small: No one shows up to a holiday brunch ready to eat their faces off. Okay, MOST people don’t. During the holidays, everyone is up to their ears in cookies from co-workers, sweets at home, and candy cane colored everything. The last thing people want is to be force fed your giant culinary mess. I also like to keep things small so that it’s never apparent how much any one person has eaten. Maybe somebody wants only one slice of apple. Maybe somebody else wants eight pounds of hasbrown casserole. No judgment. 3. Balance the sweet and the savory: One year I attended an office potluck holiday party where someone brought chicken wings… they disappeared in about 3 minutes and at the end of the night there were more cookies and cakes leftover than you could shake a stick at (that’s how that saying goes… right?). The moral of the story is that one cannot live on sweets alone… trust me. I’ve tried. 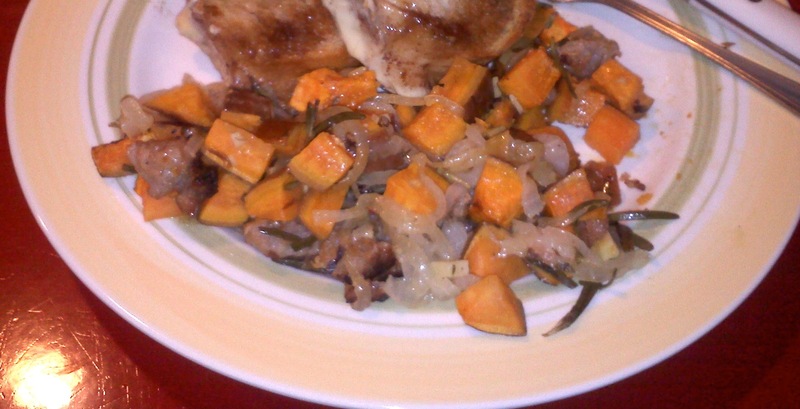 Make sure for every sweet dish, you have a savory. 4. Loosen up: No one cares if your plates match or your house is spotlessly clean. They care that they’re all together under one roof, oftentimes for the only time that year. Forgive the spills, laugh off the food flops, have another cocktail, and remember: brunch is an early meal so you can be asleep by 8. Amen. 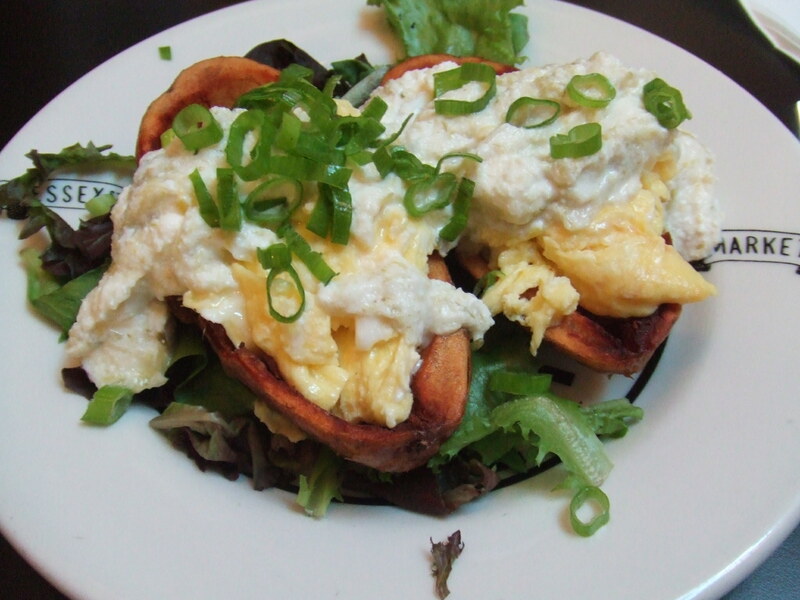 The last dish on the brunch menu is one I am a tiny bit embarrassed about… it contains Fluff. That’s right. That disgusting, sticky, white spread that my mom wouldn’t let me have when I was a kid but I would sneak at friends’ houses (sorry, mom). It’s gross. But you know what? It makes a damn fine dip for fruit. And when I started researching “fruit dip” this one came up more than I care to mention. So should you dare to add one of those vintage-labeled jars to your cart at the supermarket, you won’t be disappointed. Cross my heart. Add Fluff and cream cheese to a large bowl. Using an electric mixer, blend the mixture together. Pour into a bowl and top with a sprinkle of cinnamon for decoration if you wish. Cut up fruit to serve alongside, such as pears, apples, and grapes. There’s a headline that’ll get your attention, am I right? 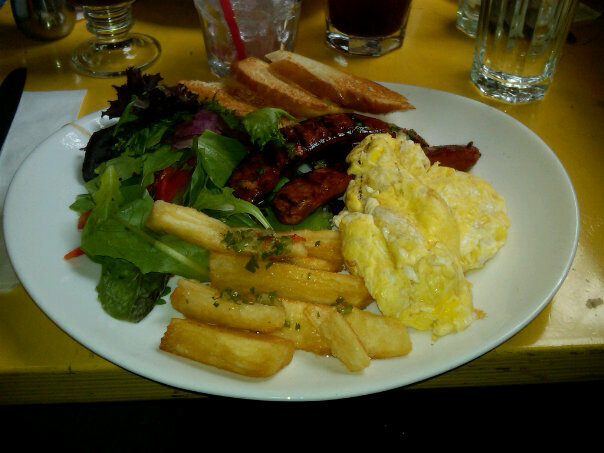 This past weekend I went out for a delicious brunch with my lovely friend, Ben. When he sent me a list of possible new brunch spots, I saw the words “free sangria” and all other information was null and void. If there’s a better way to kick off your Sunday, I have never heard of it. Agozar 326 Bowery and Bleecker St, New York, NY. Agozar is a Cuban-inspired restaurant positioned in a trendy neighborhood but with friendly prices. The brunch can not be beat! For around $15 – $17 you get an entree and two-hour unlimited free sangria. Verdict: I don’t know, I’m still drunk. Kidding! The food was DELICIOUS. An unlimited brunch drink special is no good if the food isn’t worth going for alone, and Agozar did not disappoint. Most would tell you I have an eggs benedict addiction and while they may be borderline correct, I just love trying out a new take on my favorite dish. My only criticism is that I like a thick slab of ham and you can see that this was sliced deli thin. 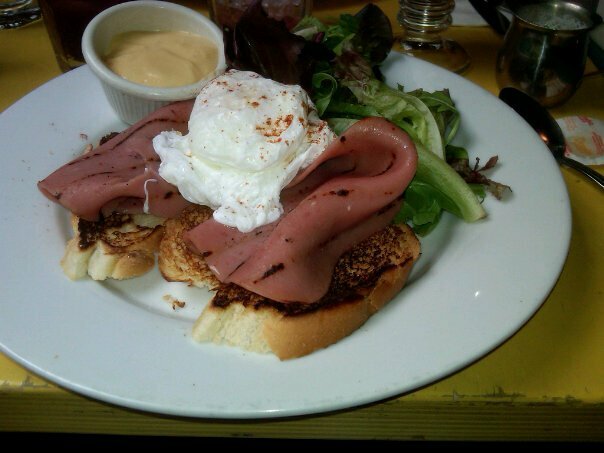 In my opinion, when you have a hearty dish like eggs benedict you need the meat to stand out on its own. The chipotle hollandaise was a slightly spicy take on your standard hollandaise and while not a fan of anything spicy myself, I was putting this stuff on my lettuce and debating licking the plate clean. The chorizo was also perfectly done, crispy and hot off the grill and served in link form, which I prefer to the chorizo crumble you get in a lot of restaurants. It should also be said that while the sangria was free, it was also very tasty. And they are not shy about refilling your glass! I highly recommend it.